Walt Disney’s classic animated movie, — ‘The Jungle Book‘, based on the stories by Rudyard Kipling, featuring the adventures of Mowgli, an orphan boy raised by wolves, who has to be taken to the human village to protect the wolf pack from the wrath of Shere Khan, the tiger – a wonderful classic, featuring the voice talents of Phil Harris and Sebastian Cabot, among others. The Walt Disney company’s marketing department tends to throw the title — ‘classic’ around a little too loosely — but in the case of The Jungle Book, it’s justified. The Jungle Book is an enduring classic, for several reasons. First, the artwork in the animation is top notch — it’s visually beautiful and uses the backdrop of the jungle to good effect. Second, the music is catchy, captivating, and natural — it flows from the story and isn’t forced on top of it. Some of the songs are absolute classics, such as The Bare Necessities (nominated for an Oscar), I Wanna Be Like You, etc. Thirdly is the voice talent — the hilarious Phil Silvers is the perfect voice for the happy-go-lucky bear Baloo, as is his counterpoint, the serious, all-business panther Bagheera voiced perfectly by Sebastian Cabot. The other voice talent is absolutely wonderful as well, such as Sterling Holloway as the snake Kaa (instantly recognizable from a very similar role in Walt Disney’s Robin Hood), George Sanders as the silky smooth and utterly dangerous tiger Shere Khan, etc. It’s a wonderful children’s film that adults can enjoy as well, and it’s strongly recommended. A classic 1967 Disney animated film that’s loosely based on Rudyard Kipling’s book of the same name, Jungle Book tells the story of a young boy Mowgli who was raised by animals in the jungle. When tiger Shere Khan threatens to return to their part of the jungle, the other animals decide that Mowgli must return to the man village in order to ensure his safety. Panther Bagheera has difficulty convincing Mowgli to follow him to the man village and recruits the help of a big lovable bear Baloo. Mowgli’s journey is one of wit, song, and many surprises. A timeless film populated by strong characters bursting with personality, great music like Bare Necessities and I Wanna Be Like You, and inspiring animation by Frank Thomas, Ollie Johnston, and other master animators, Jungle Book captivates audiences of all ages. One of the most popular Disney films ever, THE JUNGLE BOOK is a song-filled celebration of friendship, fun, and adventure set in a lush and colorful world. Inspired by Rudyard Kipling’s — Mowgli — stories, Disney’s 19th animated masterpiece was the last animated feature that had Walt Disney’s personal touch. The jubilant adventure begins when Mowgli, a little boy raised by wolves, is urged by his friend Bagheera, a wise old panther, to seek safety in the man village. Feeling very much at home in the jungle, Mowgli resists and runs off. Much to Bagheera’s dismay, Mowgli meets a new friend with a happy-go-lucky philosophy of life — Baloo the Bear, a lovable — jungle bum. — Together, the three buddies find the journey back to civilization anything but civilized! They encounter a crazy orangutan, the hypnotic and sly snake Kaa, and the menacing Shere Khan! 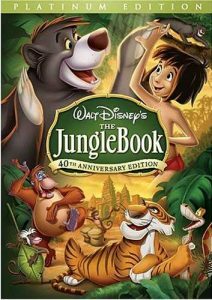 Fully restored for this 30th anniversary edition, this enduring classic swings with jazzy toe-tapping music, including the Academy Award(R)-nominated The Bare Necessities, and the freewheeling I Wan’na Be Like You! 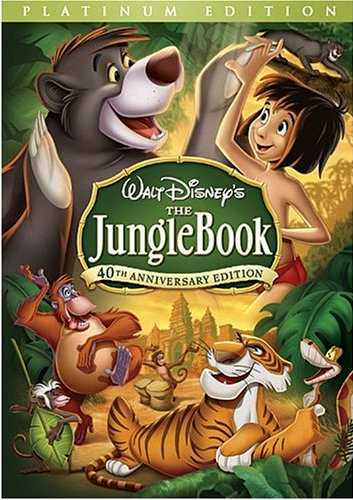 A thrilling story for all ages, THE JUNGLE BOOK is an absolute necessity for your video collection.